A meeting of the bond holders of the Chesapeake and Ohio Canal was held in Washington on the 8th inst., representing nearly a million dollars. They adopted a resolution appointing a committee to represent their interest before the Legislature of Maryland in order to procure the management of the Canal divested of the State control, or the passage of an act for the sales of the said work on terms securing to the bond holders the payment of their claims and a coupon on every bond and a tax of a quarter per cent, to be assessed to defray the expenses. 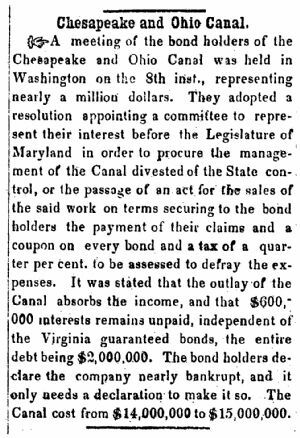 It was stated that the outlay of the Canal absorbs the income, and that $600,000 interests remains unpaid, independent of the Virginia guaranteed bonds, the entire debt being $2,000,000. The bond holders declare the company nearly bankrupt, and it only needs a declaration to make it so. The Canal cost from $14,000,000 to $15,000,000.